With just three weeks until WrestleMania, this week's 205 Live was another big week for the Cruiserweight brand as WWE continues to revamp the brand and reinvent its identity. This week saw Drew Gulak and Mustafa Ali go head-to-head to decide who faces Cedric Alexander for the vacant Cruiserweight Championship at WrestleMania, Hideo Itami battle Lince Dorado and TJP face the returning Kenneth Johnson...but was it any good? Here's our review. Before the match - Drew Gulak gave a good account of himself during a sitdown interview, explaining his return to a serious edge and promising to prove himself right with a straight-forward approach to his semi-final match - Mustafa Ali spoke about being a police officer in Chicago and seeing the Cruiserweight title as a way to fix things and change people's minds about someone called Mustafa Ali. As competitors and characters, there may be very few pairings as perfect as Drew Gulak and Mustafa Ali and whilst they've had a number of matches together over the last year, including a very good two out of three falls match in last summer, I don't think it was ever more evident than it was here. Gulak is a direct, hard-hitting win at any costs bully, whilst Ali is a high-flyer, who fights with his heart on his sleeve and is looking to change opinions, with both men excelling in their roles and producing some of the best action in the tournament up to this point. Whilst I would've liked to have seen this one get a little more time and develop on a number of the ideas thrown up, the bout between the pair here did a grand job of mixing broad strokes with little touches and storyline elements to create a fascinatingly, rich piece of professional wrestling. The idea that Ali was having to almost match the brutality and relentlessness of Gulak in order to compete, drawing on what Ali had been saying in promos leading up to the match, was a clever one, highlighted by Ali laying into Gulak's ribs with kicks that mirrored Drew's actions earlier in the match, whilst the commentary called back to the promos and suggested that Ali would have to be careful not to get too into the viciousness. The final third of the bout focused on some big spots on the outside, as the two made creative work of WWE's ringside area, including a back body drop off the announce table and a powerslam into the timekeeper's area for a good countout near fall. However, for me the finish came off as a little sudden and struggled to compete with what had came before, as Ali managed to reverse a powerslam into a tornado DDT, before the 054 got the win for the Illinoisan. I think it could've done with a few more minutes and a maybe an extra near fall or two once the action got back in the ring to push this to the next level and get it on a par with last week's Cedric Alexander vs. Roderick Strong match. After the match - Mustafa Ali cut a promo about going to WrestleMania and how he was proof that all that matters is what's in your heart. 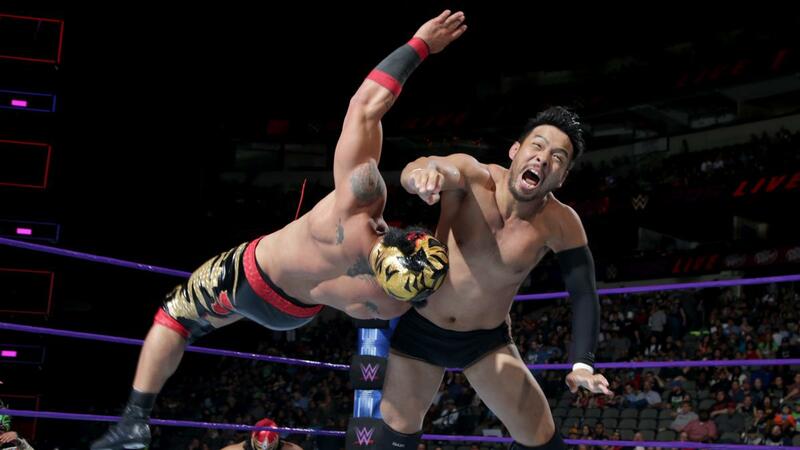 There were elements of a good match as Lince Dorado and Hideo Itami clashed this week, but the finish ended up coming off as a real disappointment, because of the huge amount of promise that the pair had shown together, as Gran Metalik simply pushed Itami into the apron to cause a disqualification and give Itami the win. I understand the need to keep the feud going, but it's still hard not to feel let down when the match is feeling like it's heading in an interesting direction and moreso because the DQ was caused by a babyface so there's not even an argument to be made that the heel is taking something away from the audience to build heat. However, the action that was on display ranged from okay to very good, with the respective styles of Itami and Dorado meshing nicely as Itami's no-nonsense offence being juxtaposed well by Dorado's corkscrew planchas and mad rana situations. The moment where the match felt like it began to build towards what could have been a thrilling conclusion was Dorado matching Itami with slaps to the face and beginning to fire up, with the Puerto Rican impressing as he held his own with one of the division's hardest hitters. There's potential for this feud to grow into something, especially with the upcoming introduction of a Cruiserweight Tag Team title, but I'd like to see a little more thought go into how it's going to develop week on week within the current 205 Live structure. TJP ran through the returning Kenneth Johnson (back for the first time since losing to Akira Tozawa in the first round of the Cruiserweight Classic), winning with a TJP Clutch, after the conclusion of a poor match where it looked like Johnson had never been in a ring before. After the match - TJP held onto the TJP Clutch for some time after the bell. - Cedric Alexander spoke about last week being the greatest moment of his career, but claiming it wouldn't mean anything unless he won the Cruiserweight Championship.